This Saqqarah tapestry shows a design displayed in the tomb of Ptah-hotep, an ancient Eqyptian official from the 25th century BC. Ptah-hotep or Ptahhotep wrote the instruction of Ptahhotep, a literary work of wisdom, during the rule of Djedkare Isesi in the 5th Dynasty. Ptahhotep was buried in Saqqarah an ancient burial ground in Egypt, famous for its numerous pyramids, and mastabas. His tomb is well known for its outstanding depictions. With hieroglyphics as well as beautifully detailed illustrations, this work is like a record of life in ancient Egypt as we see their daily life, instruments, and animals. The colors are typically stone accompanied by paint colors to render the figures. 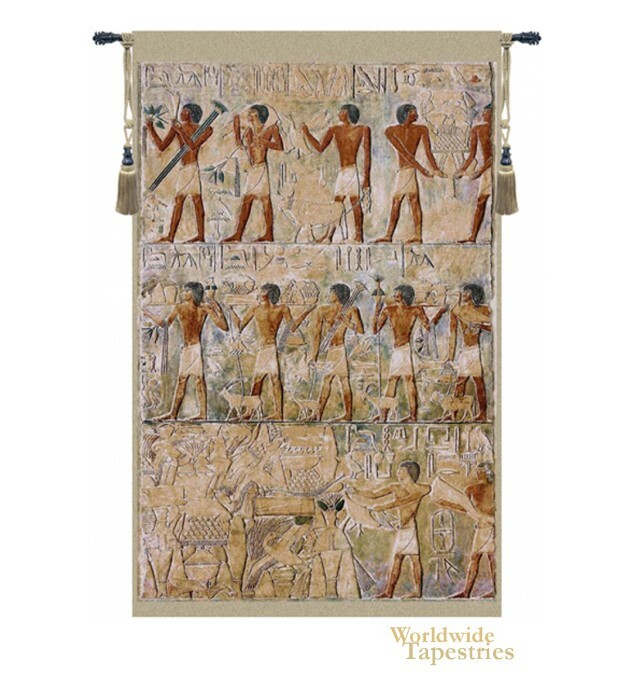 This Egyptian style Saqqarah Beige tapestry is backed with lining and tunnel for easy hanging. Note: tapestry rod and tassels, where pictured, are purchased separately. Dimensions: W 54" x H 82"